Each year, Jack’s Helping Hand hosts the Imagination Park Fall Classic Golf Tournament. Funds from the golf tournament go to completing the Jack Ready Imagination Park. Located on the Nipomo Mesa, this is the only park between the Bay Area and LA dedicated to making sure children with special needs and their families have a safe and accessible place to have fun. 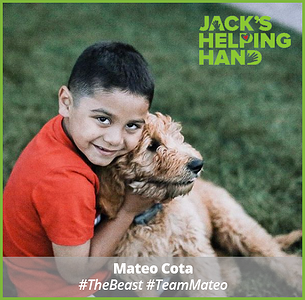 If you would like to join us and raise funds, please click on this link (it will take you directly to the Jack's Helping Hand Fundraising page): Go Team Mateo! In addition to serving on many boards of directors and participating in local events, such as the Transitions Mental Health Strike Out Stigma Bowl-a-Thon and the RISE Fashion Show, our Digital West team belongs to Chambers of Commerce and Rotary Clubs along the coast. We are proud to be a sponsor of Cal Poly Athletics as well, especially knowing that university programs encourage development of all kinds on the Central Coast. We volunteer our time with conservation groups, lifeguards, arts organizations and church organizations. As a company, we have a special interest in and have invested heavily in building the technology infrastructure necessary for our area's economy and businesses to grow. The first step was creating fast internet MetroFiber connectivity around San Luis Obispo and we continue expanding fiber access to Central Coast communities. Digital West is always excited to support technology initiatives such as the SLO HotHouse and groups such as Softec and their Softec Robotics Expo. Here are a few places we'll be this fall, please join us!